Great holding capacity for many crafts. No pins required! 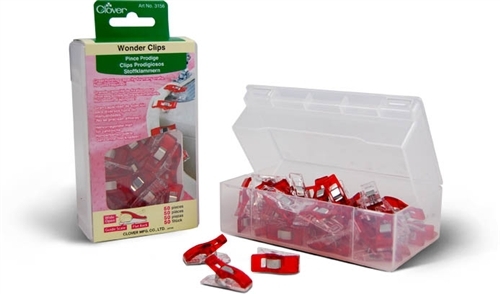 Clips open wide to hold layers of fabric. Great alternative to pins especially when working with quilts, handbags and heavy weight fabrics. Clip base is flat for easy feeding to the presser foot. Clips measure approx. 1” x 3/8” and include seam allowance markings on reverse side. With storage box.